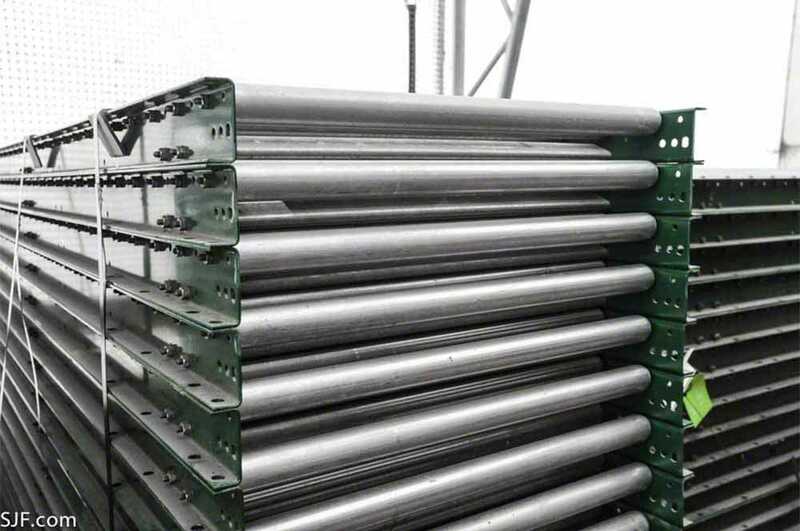 What is Gravity Roller Conveyor? 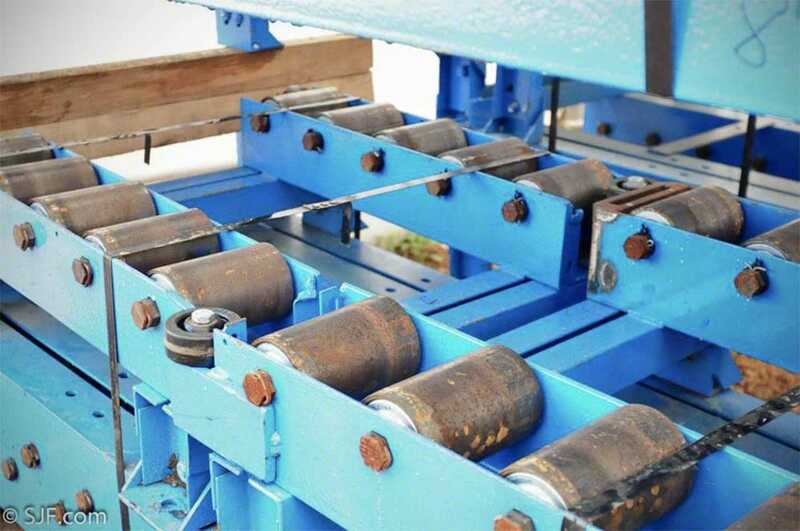 This page contains photos, sizing and pricing for used gravity roller conveyor. 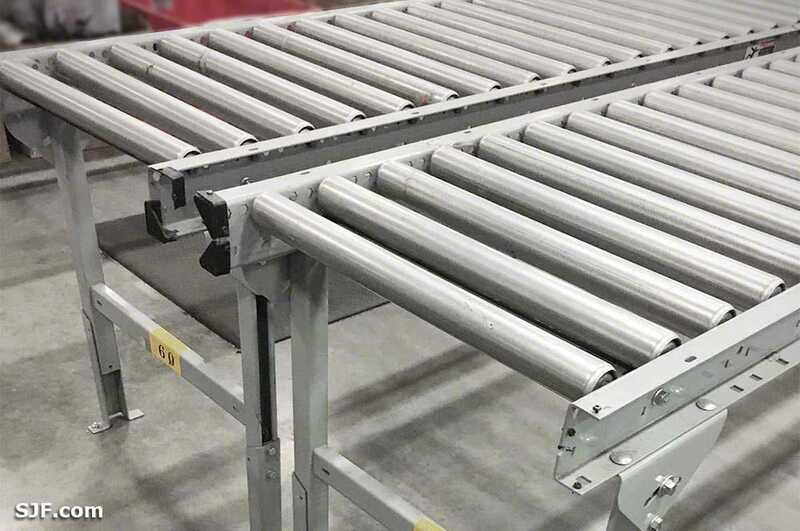 If you're interested in new gravity conveyor, see our Gravity Roller Conveyor page in our eStore for information and pricing. 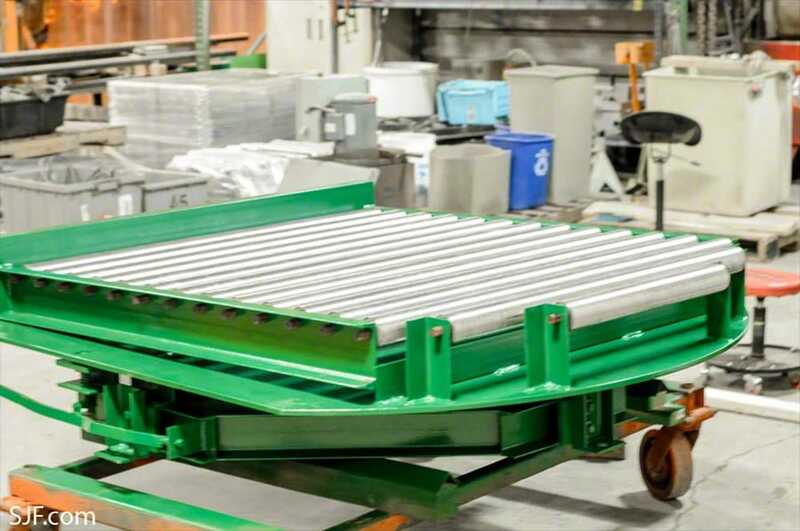 For more information on using roller conveyor to convey product, container totes, pallet handling and more, check out our Guide to Gravity Roller Conveyor. 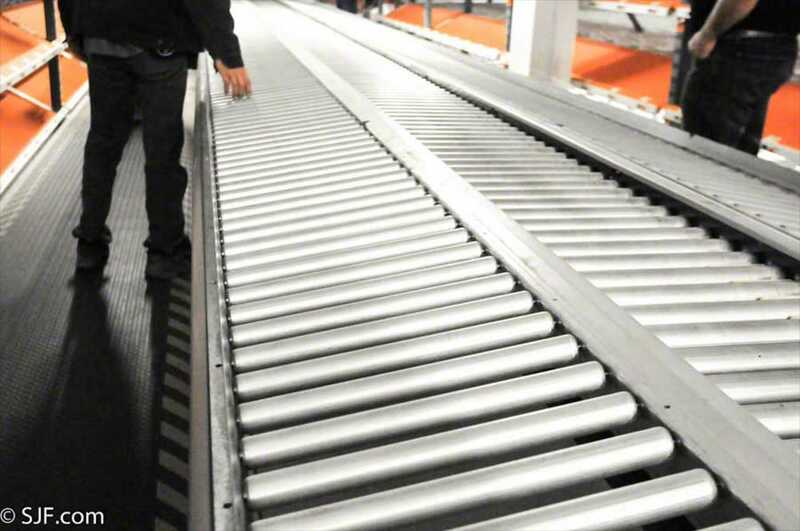 For more general information on different types of gravity conveyors How To Guide to Conveyors in SJF Material Handling's tutorial guides knowledge center. 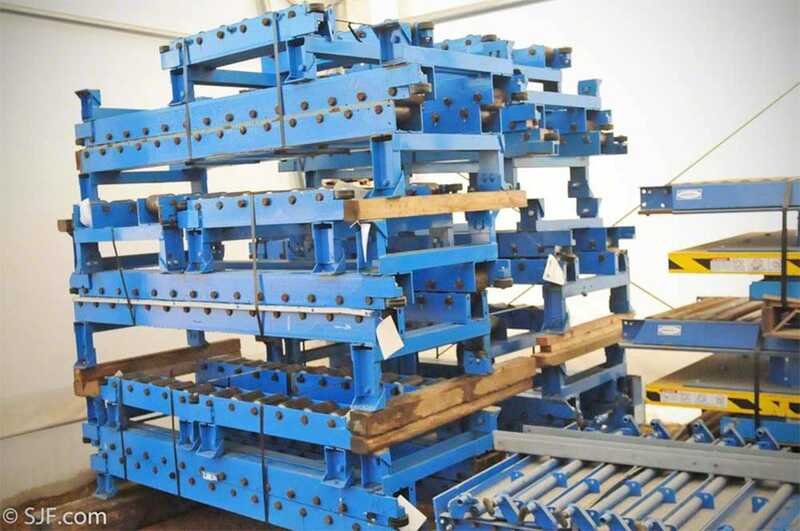 This new buy is excellent condition used gravity roller conveyor. It looks like brand new! Conveyor pricing & availability subject to change without notice. 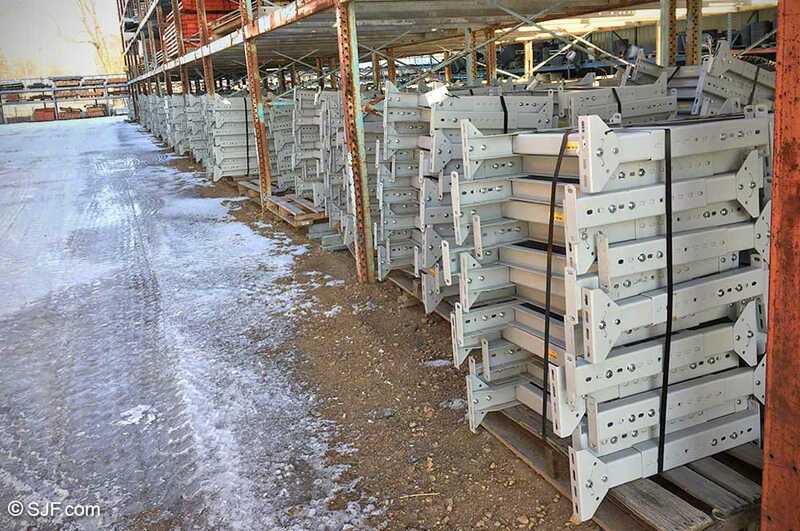 Used Conveyor H-Stands - LIKE NEW! 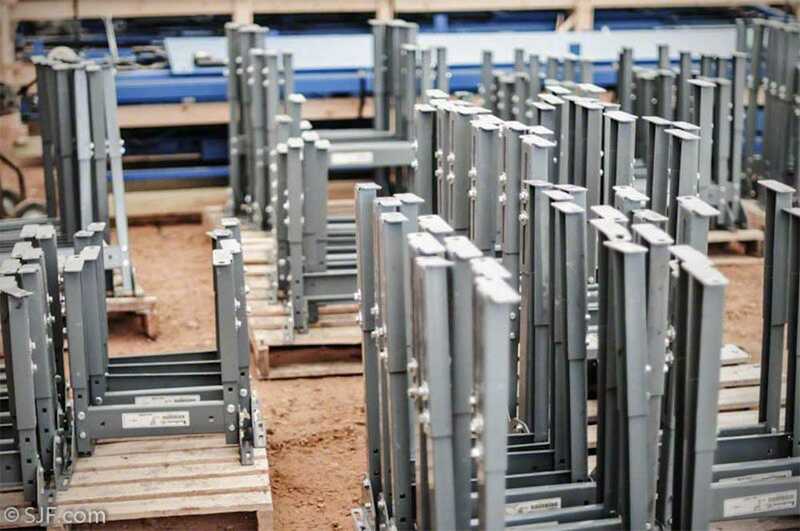 These Hytrol standard duty conveyor stands are in excellent condition. Adjustable Height: 24" - 36"
SJF Material Handling can provide a wide assortment of conveyor equipment & accessories that can be purchased separately including: Ball transfer tables - gravity skate wheels conveyors - gravity roller spurs - light duty conveyors - container totes - control systems - power conveyors & power belt conveyors - tapered roller curves and steel rollers - telescoping conveyor - roller stands - chain driven live roller conveyors - heavy duty pallet conveyors - flex conveyors and more. Can't find what you're looking for? Call us at (320) 485-4974 (direct sales line) or (800) 598-5532 and we can help. Price reduced - as low as $16.50/ft. 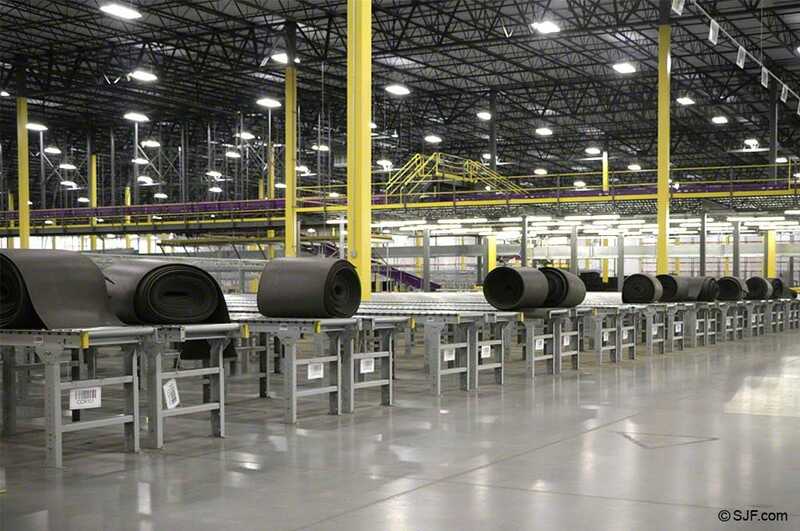 24"W x 10'L with 1-3/8" rollers on 3" centers – As low as $16.95/ft. 24"W x 5'L with 1-3/8" rollers on 3" centers – As low as $15.00/ft. 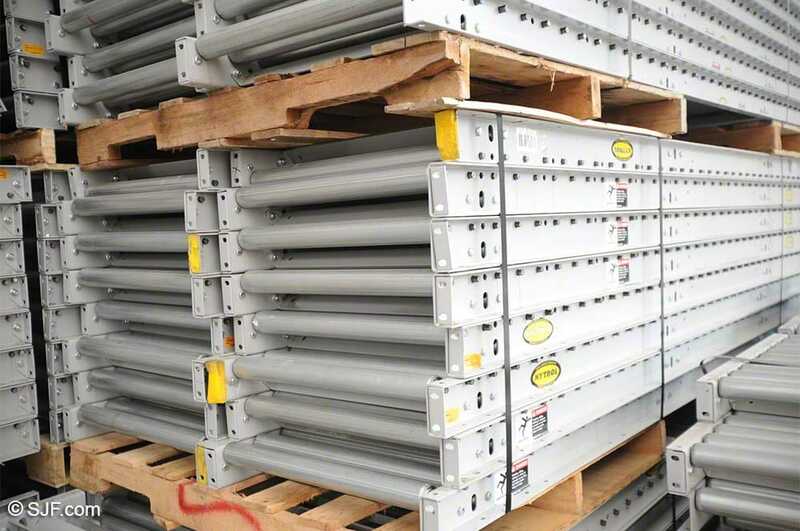 18"W x 10'L with 3.5" frames and 1.9" rollers on 3" centers – As low as $18.00/ft. 19"W x 10'L with 3.5" frames and 1.9" rollers on 3" centers – As low as $19.00/ft. 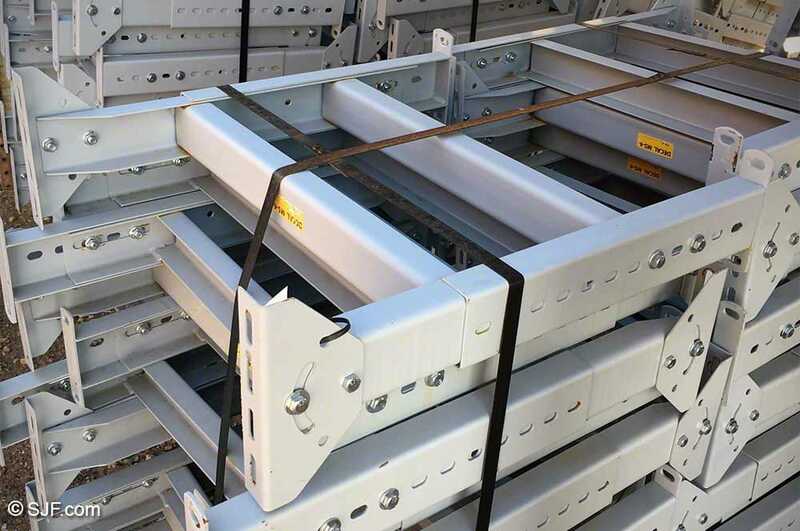 24"W x 10'L with 3.5" frames and 1.9" rollers on 3" centers – As low as $18.50/ft. 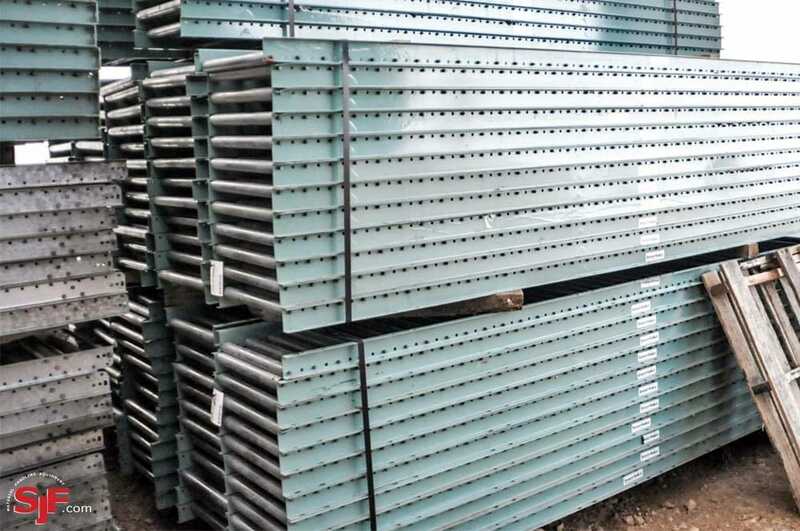 30.5"W x 10'L with 3.5" frames and 1.9" rollers on 3" centers – As low as $22.50/ft. 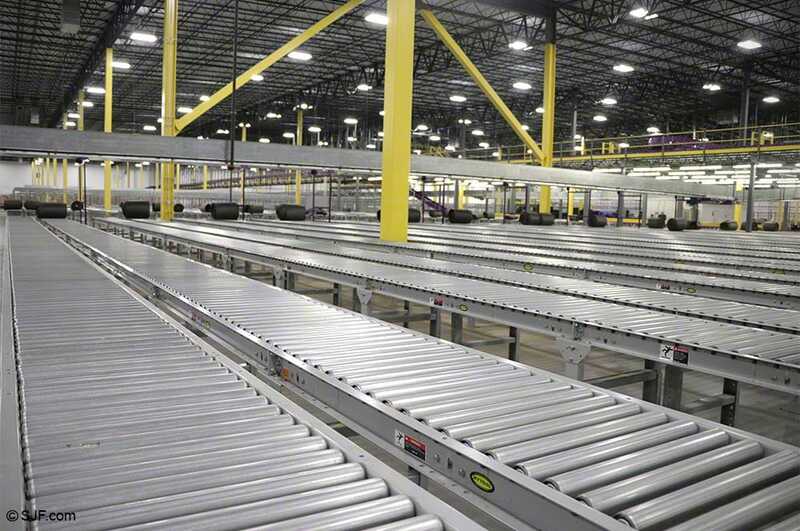 *Buying Tip #1: Ask us about special discounts on short lengths of light duty and heavy duty conveyors. 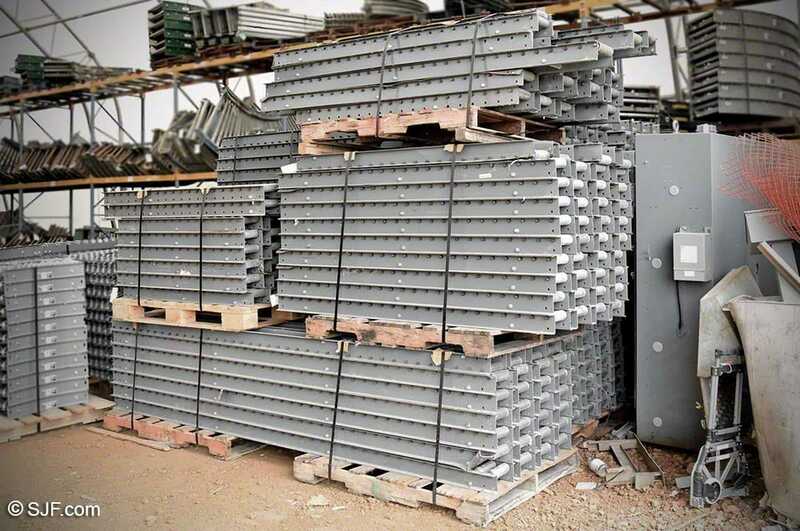 SJF stocks a wide assortment of short and odd lengths from 2'-7' in length. 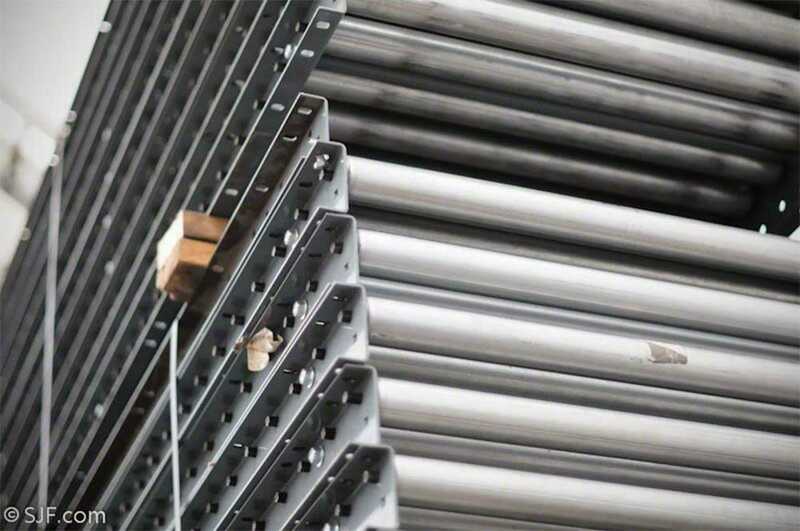 *Buying Tip #2: SJF Material Handling now stocks a wide array of roller stands, lift gates, tapered roller curves, gravity spur and power roller curves and flexible conveyors. 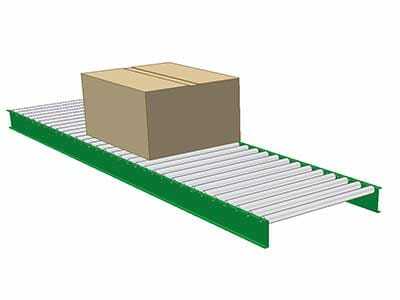 Find several widths and lengths to match your needs for quality extra heavy duty pallet conveyors & control systems. Contact us for details and current pricing. H-style stands – As low as $19.50 ea. 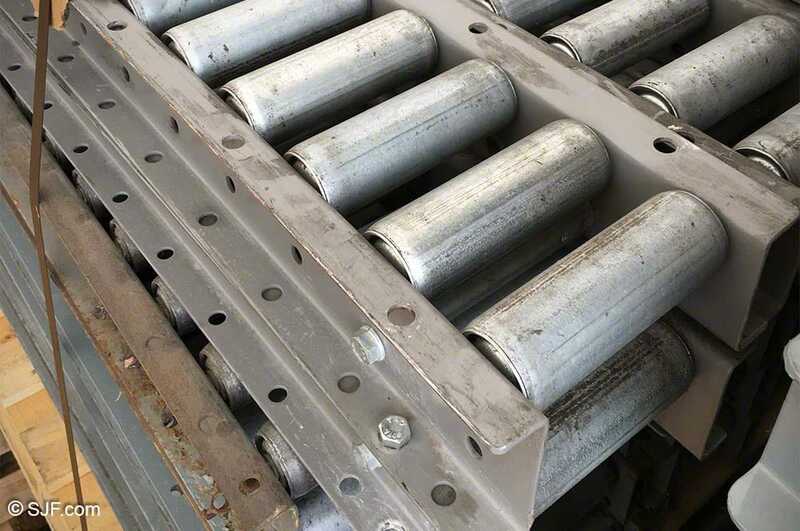 This gravity conveyor was purchased used as-is in good "ready-to-use" condition. 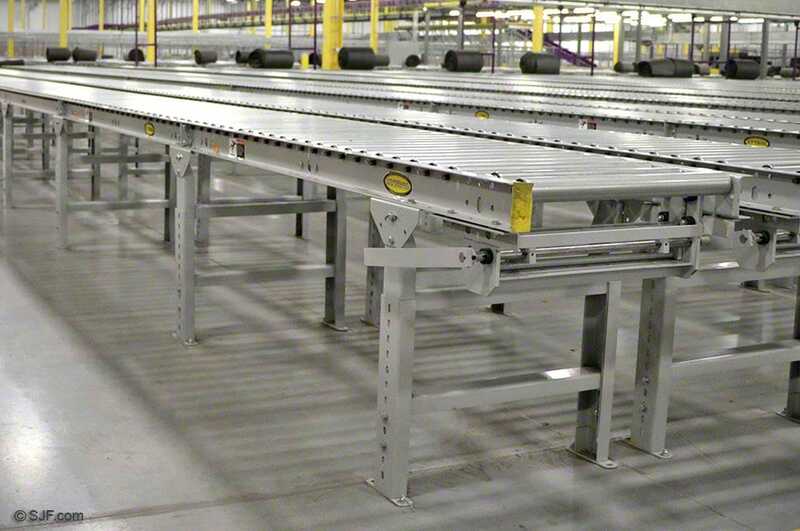 It's currently in-stock and stored indoors at SJF's main conveyor warehousing facility in Winsted, MN. 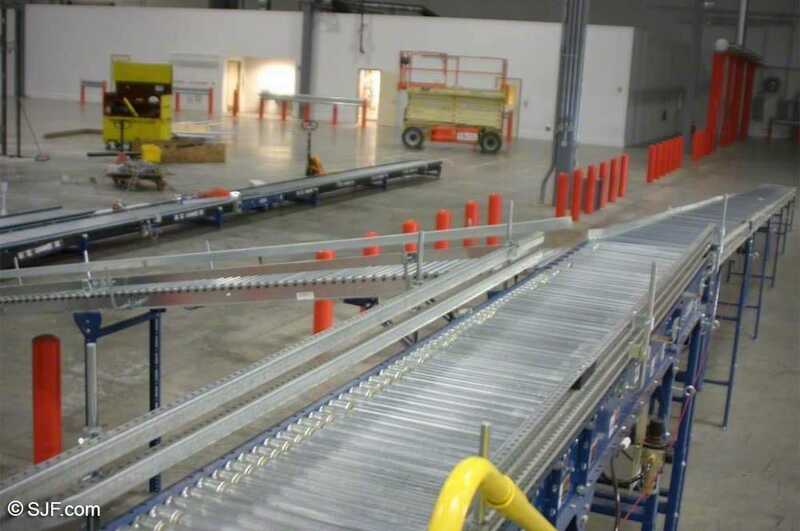 All heavy duty roller conveyors listed below are priced both used as-is and refurbished. 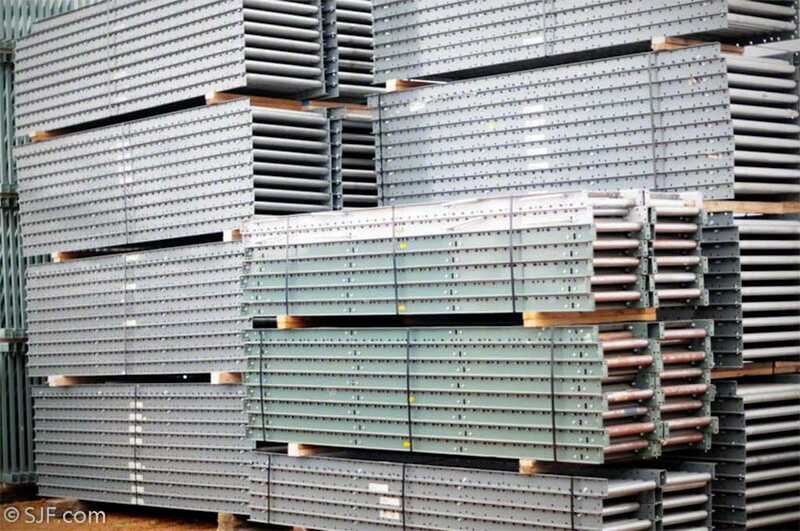 As you can see, we have a multitude of different conveyor brands and sizes to choose from. 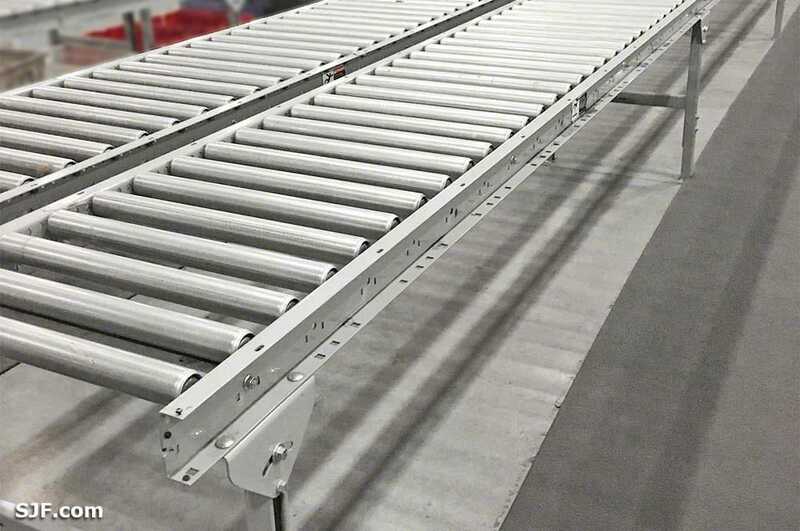 Please feel free to call our conveyor sales and support staff at (800) 598-5532 for current pricing and availability on this and other roller conveyor you might be looking for but don't necessarily see here. 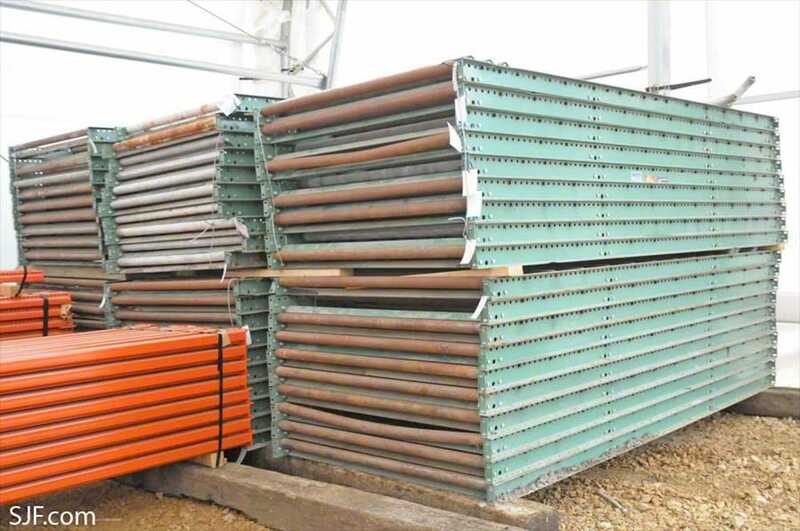 Buschman gravity roller conveyors, 24" OAW $25.00/ft. 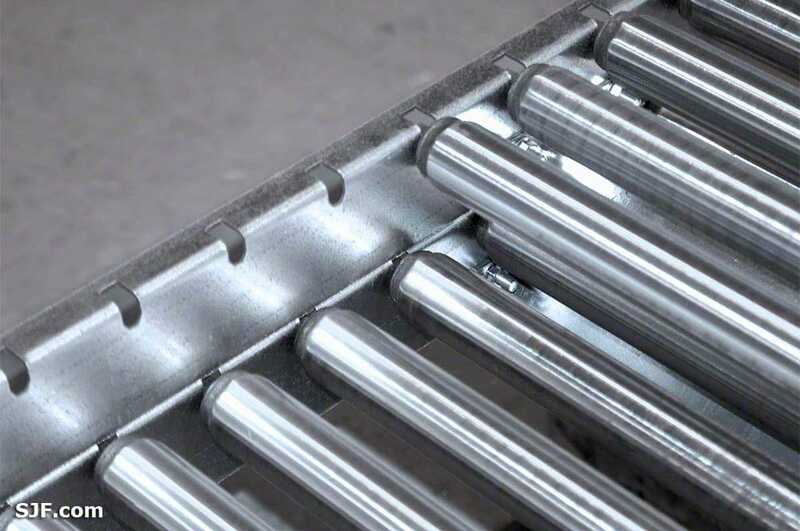 Buschman gravity conveyor, 18", 1.9" steel rollers, 3" c/c, 7/16" hex, 3.5" frame $19.50/ft. 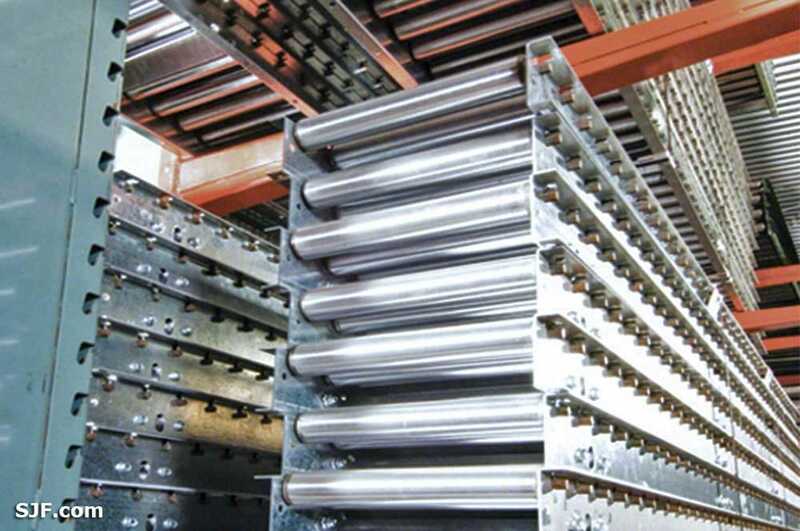 Buschman gravity conveyor, 24", 1.9" steel rollers, 3" c/c, 7/16" hex, 3.5" frame $21.50/ft. 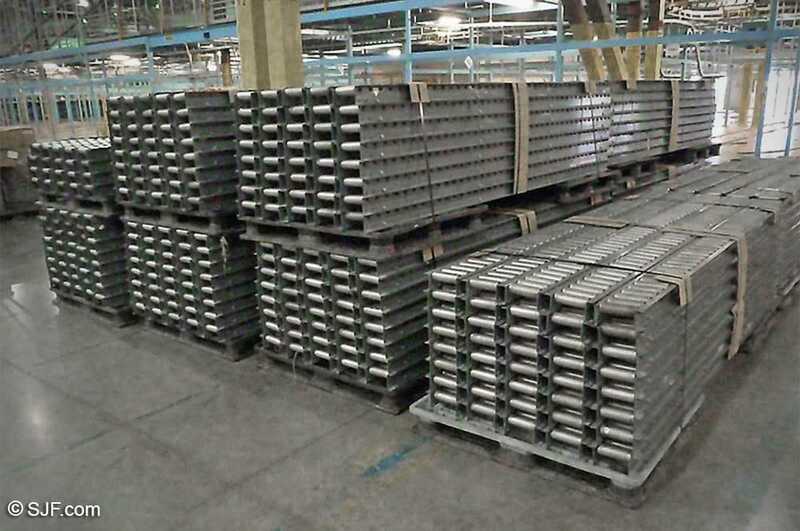 Buschman gravity conveyor, 24.5", 1.9" galvanized rollers, 3" 7/16" hex, 3.5" frame $21.50/ft. 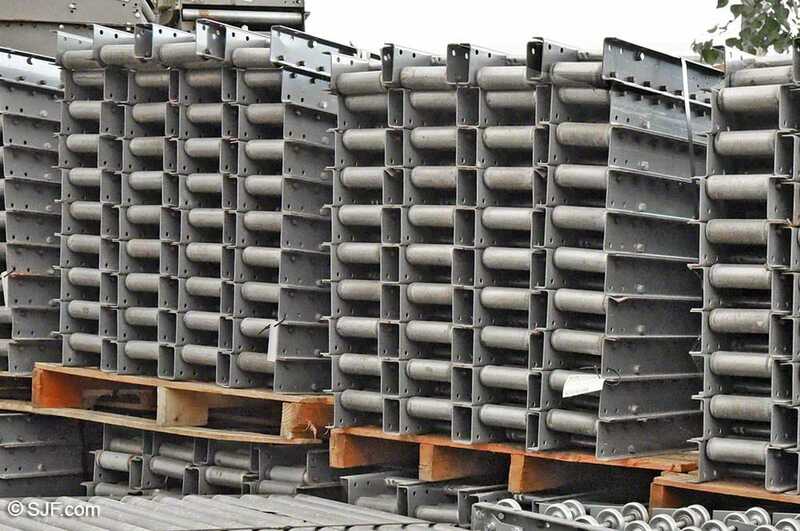 Buschman gravity conveyor, 30", 1.9" galvanized rollers, 3" c/c, 7/16" hex, 3.5" frame $24.50/ft. 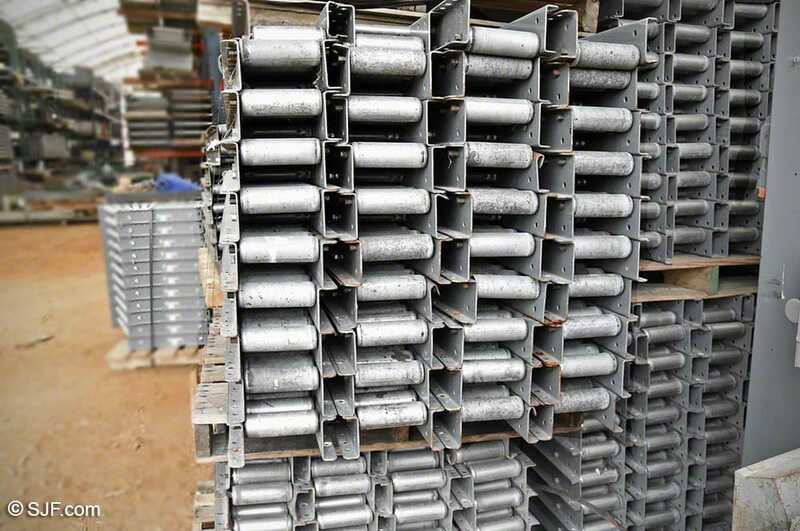 Buschman gravity conveyor, 35.5", 1.9" galvanized rollers, 3" c/c, 7/16" hex, 3.5" frame $26.50/ft. 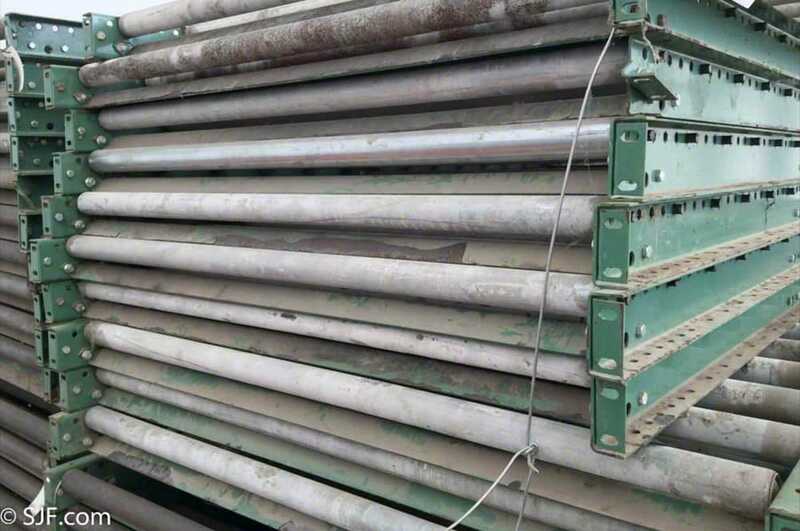 Conveyor, lift gates, 18" wide x 36" long, 1.9" galvanized rollers, 3", 7/16" hex $195.00 ea. 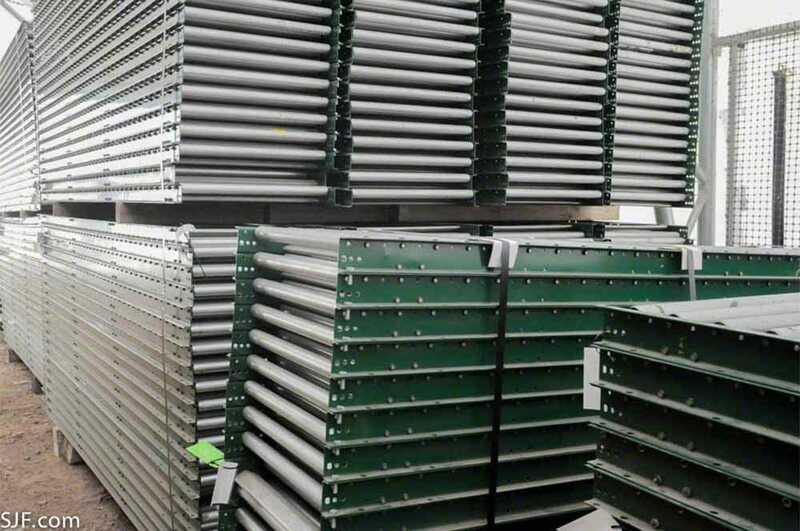 Conveyor, lift gates, 24.5" wide x 36" long, 1.9" steel rollers, 3", 7/16" hex, spring assist $240.00 ea. 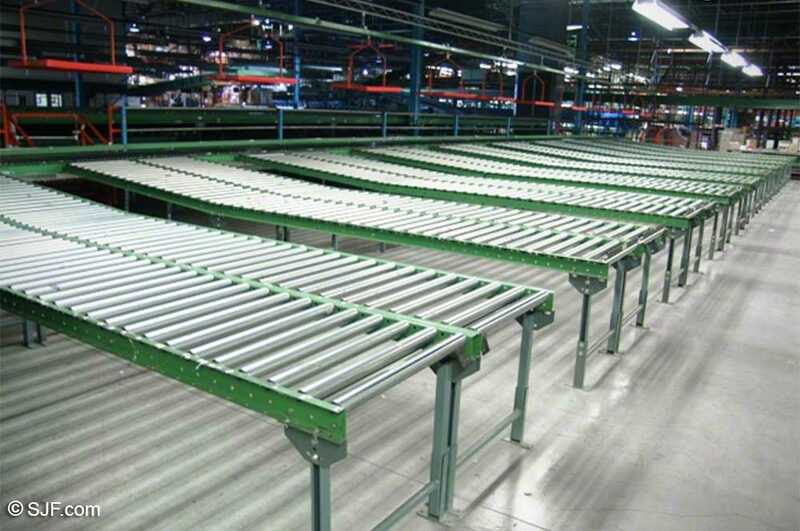 Buschman conveyors, 17.5" OAW, 1.9" rollers, 3" c/c, 10' conveyor sections, 5" frame, converted from trash conveyor $19.00/ft. 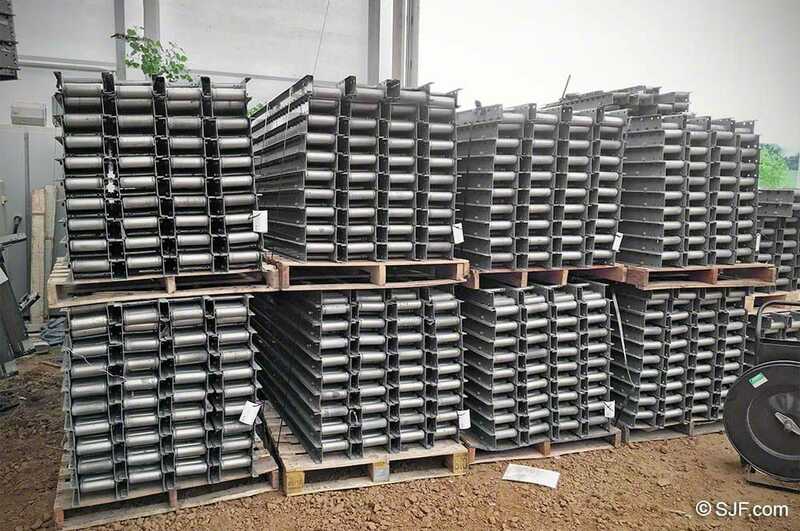 Buschman, 18.5" OAW, 1.375" rollers, 2" c/c, 10' conveyor sections, 16" between frames, painted grey, 3.5" frame $19.50/ft. 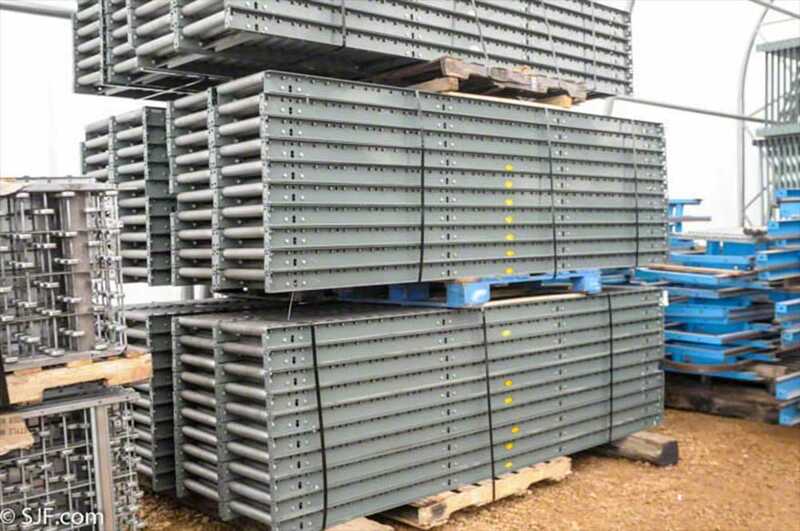 Buschman, 23.5" OAW, 1.9" rollers, 3" c/c, 10' conveyor sections, galvanized, 5" frame, was AC250 – Converted to gravity $21.50/ft. 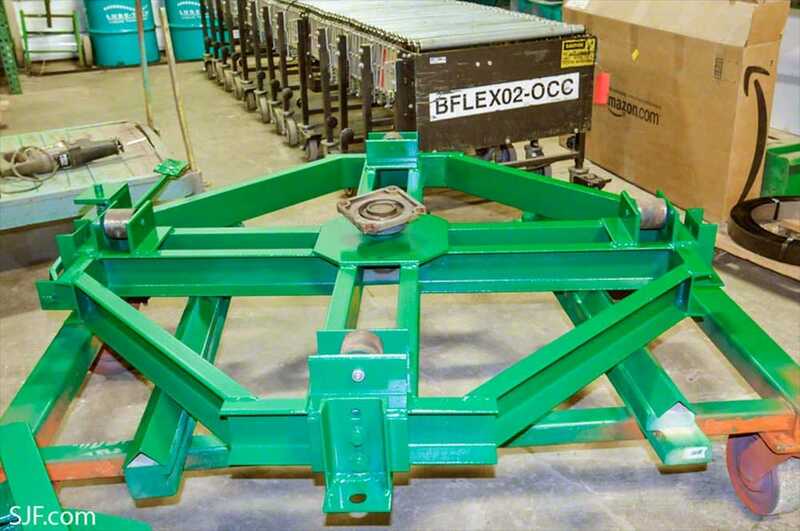 Buschman, 23.5" OAW, 1.9" rollers, 3" c/c, 10' conveyor beds, painted, 3.5" frame $21.50/ft. 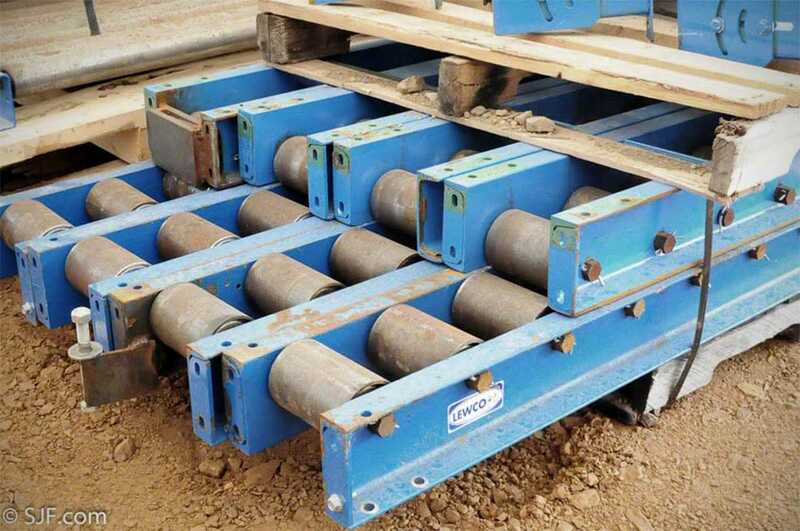 TGW Ermanco gravity roller conveyor, 18.5" OAW, 1.9" rollers, 4" c/c, 10' conveyor sections, 4.5" frame – converted from lineshaft to gravity $18.50/ft. 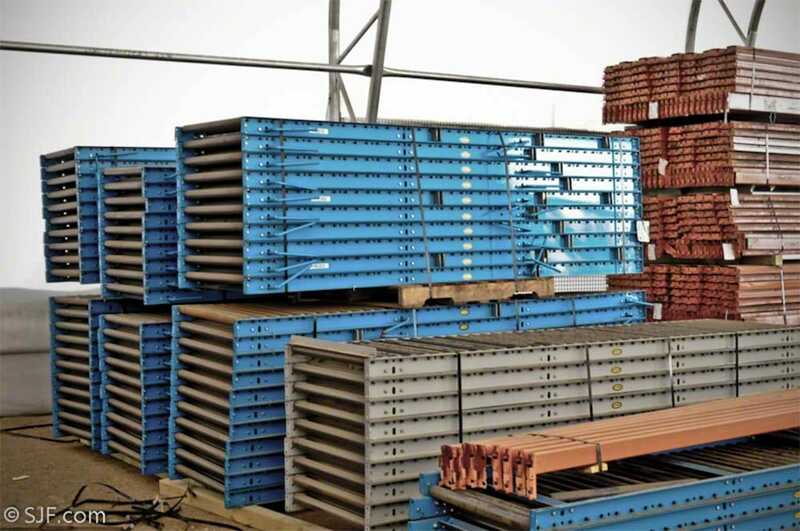 HK, 23" OAW, 1.9" steel rollers, 3" c/c, 10' conveyor sections, 20" between frames, painted light blue, 3.5" frame $19.50/ft. 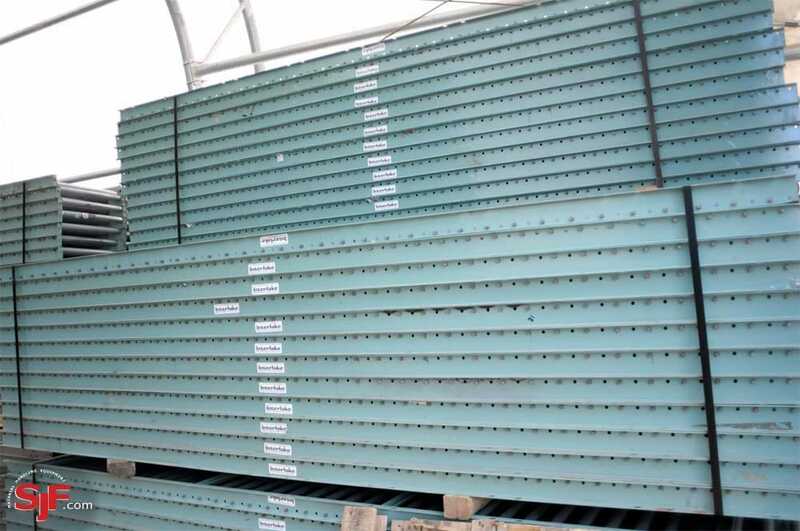 HK, 27" OAW, 1.9" steel rollers, 3" c/c, 10' conveyor sections, light blue, 3.5" frame, 3.5" frame $22.00/ft. 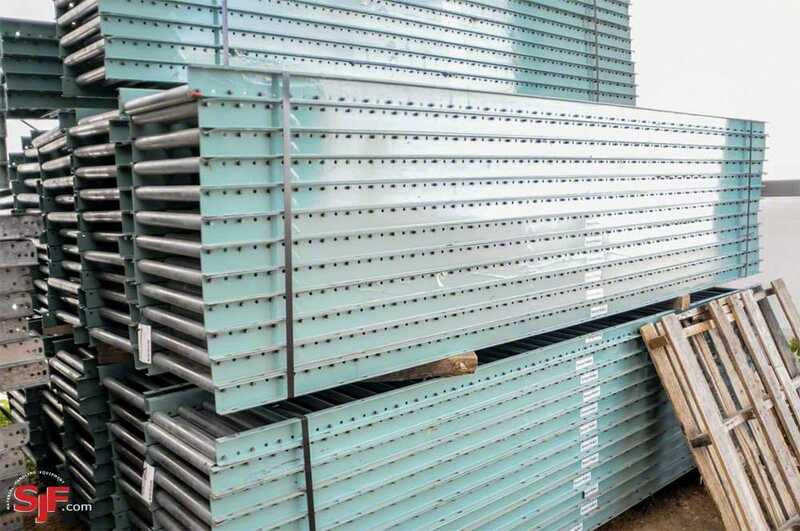 Hytrol, 18" OAW, 1.9" steel rollers, 3" c/c, galvanized, 3.5" frame $19.50/ft. 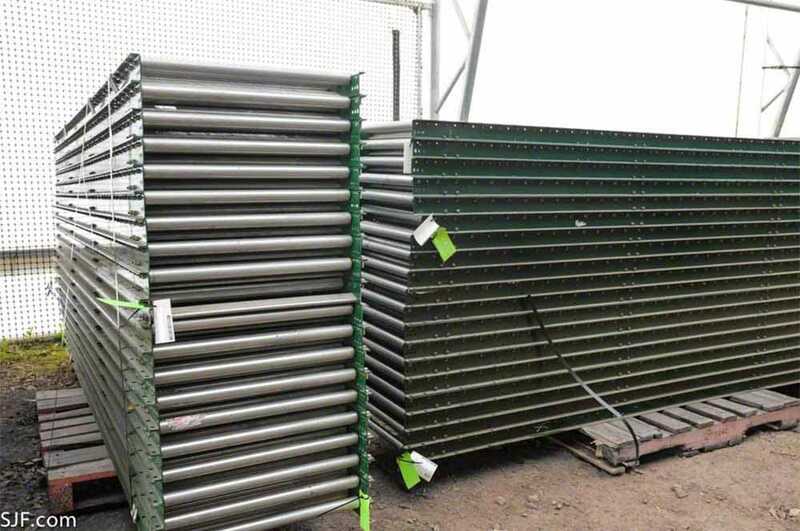 Hytrol, 22" OAW, 1.9" steel rollers, 3" c/c, 10' conveyor sections, 19" between frames, galvanized, 3.5" frame $21.00/ft. 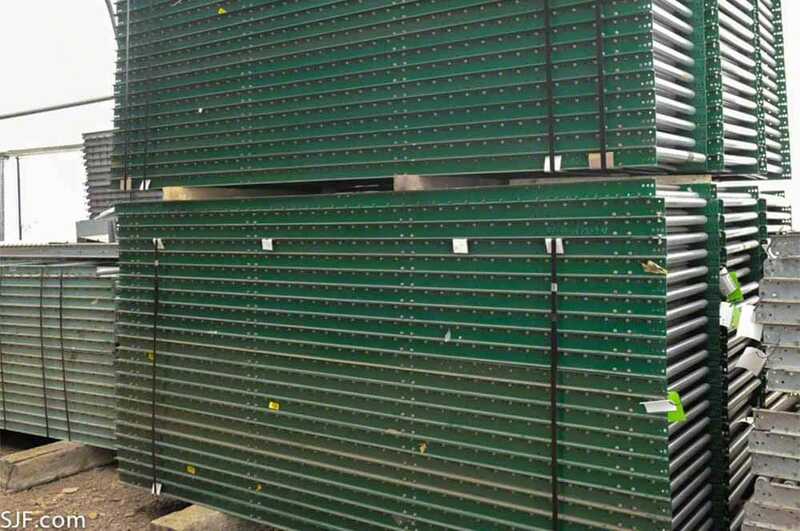 Rapistan Dematic, 24.25" OAW, 1.9" rollers, 4" c/c, 10' beds, 22" between frames, painted green, 3.5" frame $20.50/ft. 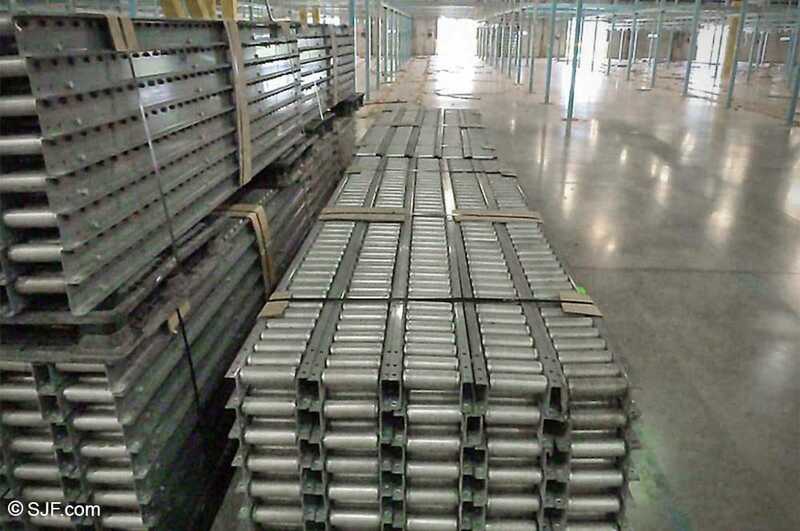 Gravity roller, 24" OAW, 1.375" rollers, 3" c/c, 10' beds, galvanized, 2.5" frame $16.00/ft. 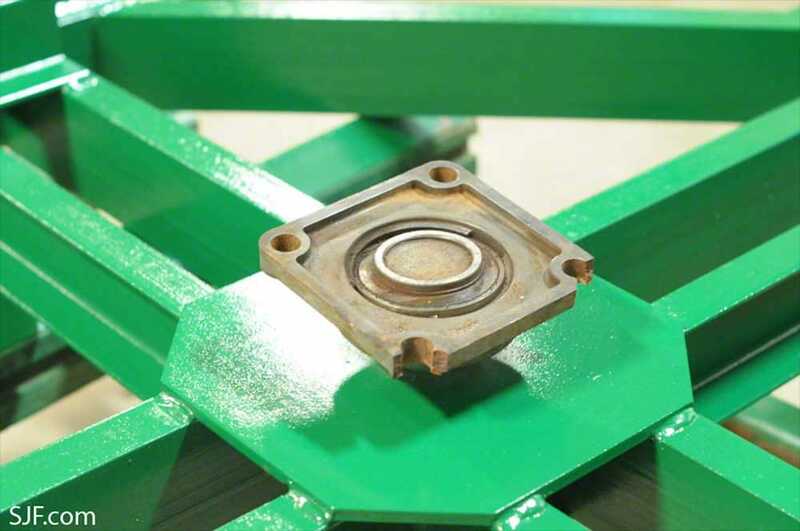 Gravity roller, 24" OAW, 1.375" rollers, 4" c/c, 10' beds, green, 3.5" frame $14.00/ft. Gravity roller, 24" OAW, 1.375" rollers, 6" c/c, 10' beds, 3.5" frame $12.00/ft. 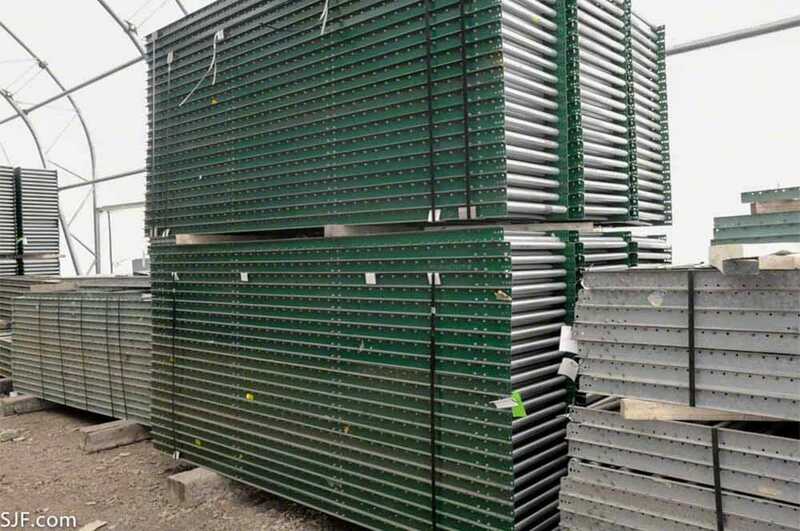 Gravity roller, 32" OAW, 1.375" rollers, 6" c/c, 10' beds, galvanized, 2.5" frame $12.00/ft. Gravity roller, 24" OAW, 1.375" rollers, 3" c/c, galvanized, 2.375" frame $16.00/ft. 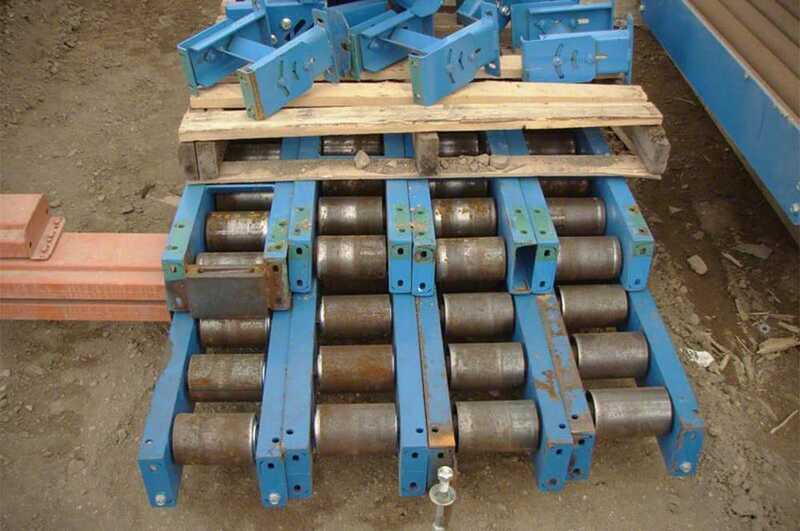 Gravity roller, 18" OAW, 1.375" rollers, 3" c/c, galvanized, 2.375" frame $15.00/ft. Gravity roller, 24" OAW, 1.9" rollers, 3" c/c, painted, 3.5" frame $21.50/ft. Gravity roller, 30" OAW, 1.9" rollers, 3" c/c, painted, 3.5" frame $25.50/ft. 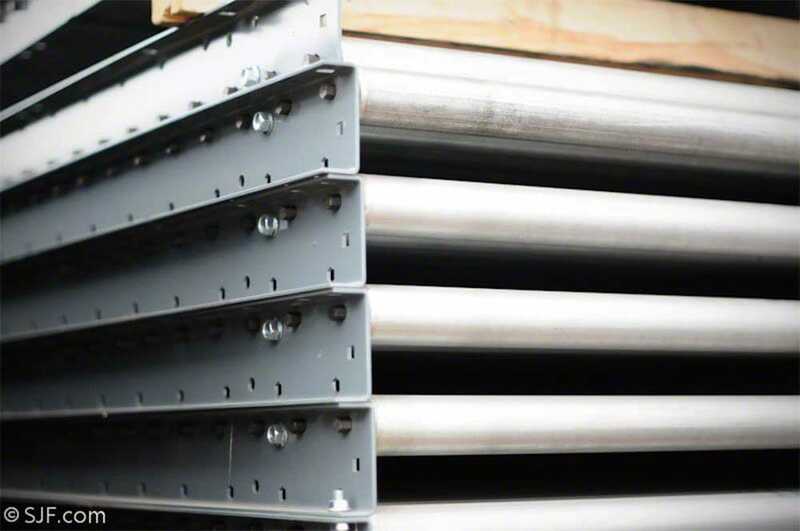 *Buying Tip: Ask us about special discounts on short lengths of conveyor. 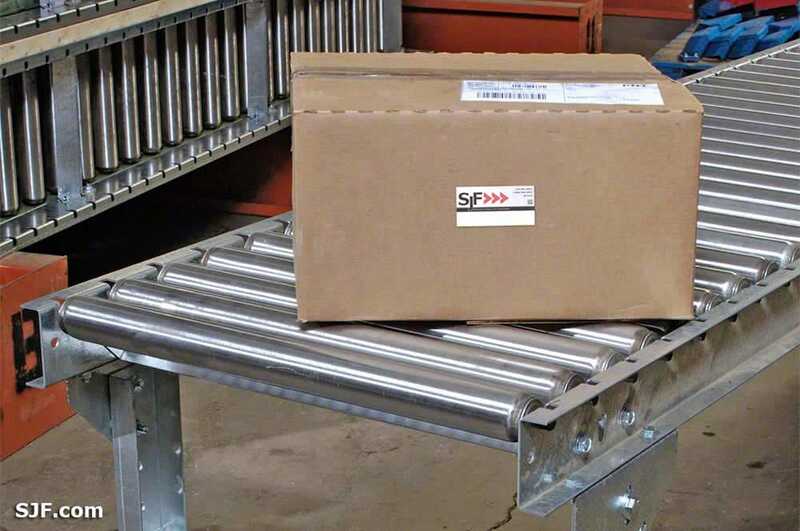 SJF stocks a wide assortment of short lengths from 2'-7' in length in several widths of roller conveyors. Contact a SJF Sales Specialist for current discount pricing on shorter sizes. 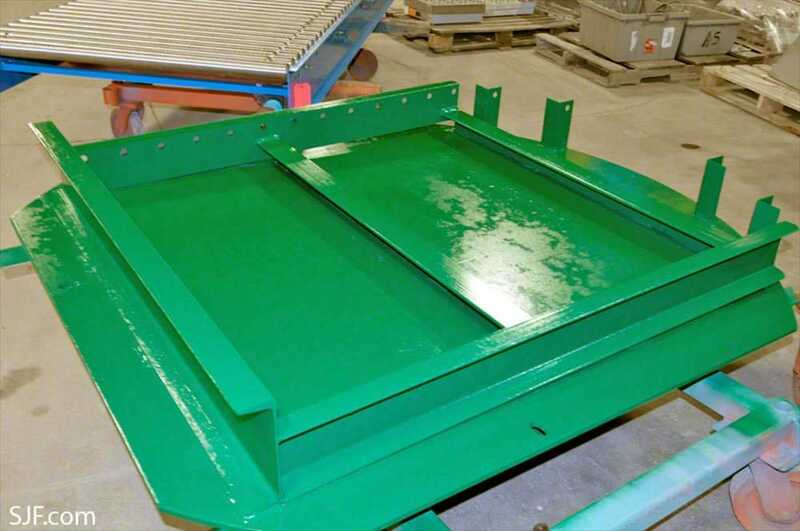 Ideal for offloading and/or handling pallets at the end of a conveyor run for a full pallet conveyor system. 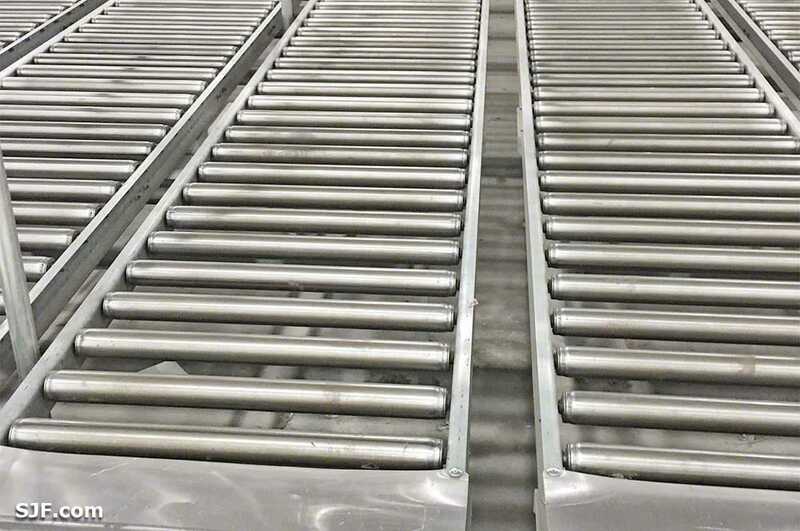 These heavy duty gravity conveyors use industrial grade Hytrol steel rollers and are in excellent, like-new condition. 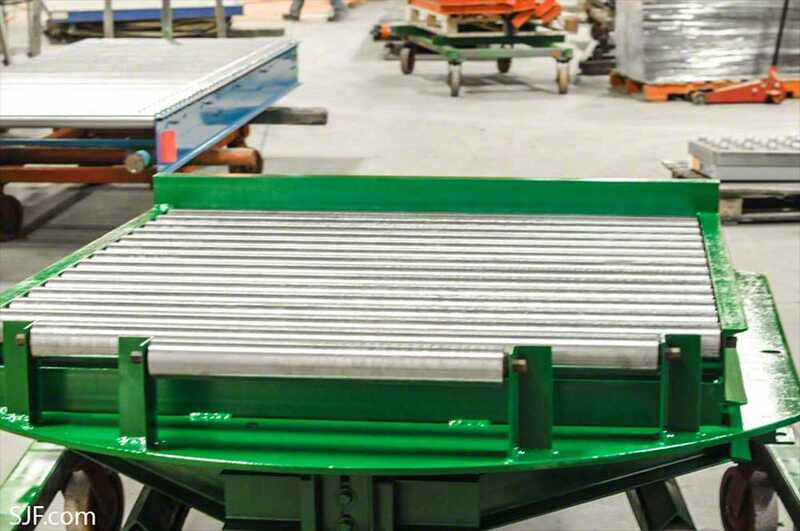 Used and Refurbished Gravity Roller Conveyor - A SJF Exclusive! 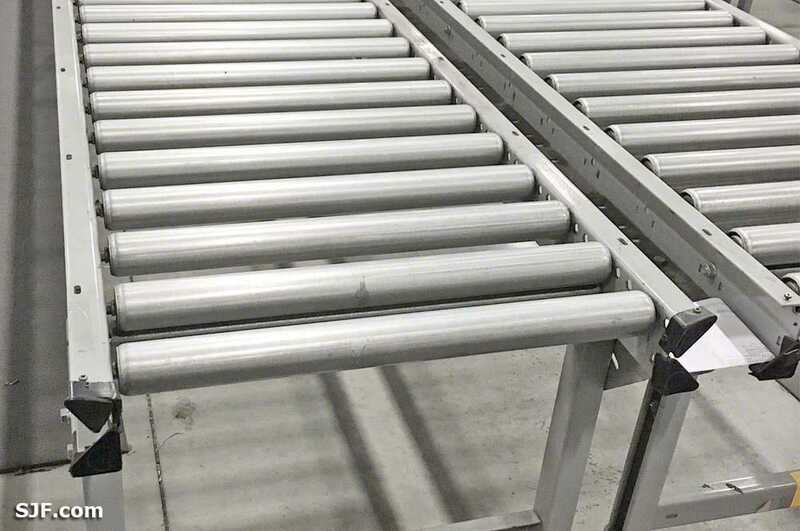 Renewed/refurbished gravity roller conveyor continues to be one of SJF's hottest selling product lines since its introduction in the spring of 2007. 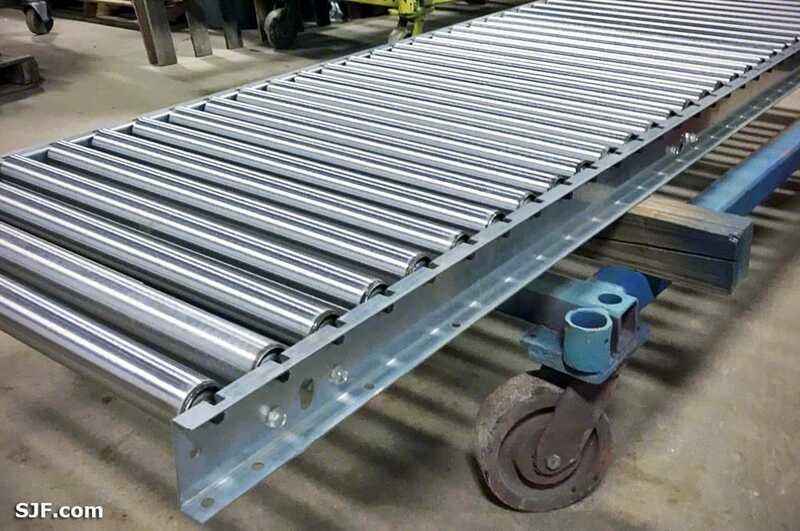 Renewed gravity roller conveyors utilize SJF's exclusive factory process where pre-owned rollers are removed, inspected, cleaned, refurbished and inserted into cleaned heavy duty steel conveyor bed frames.